The Power Chopper is fast and easy to use. Create healthy fresh food in seconds. 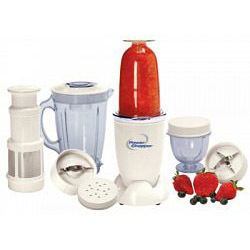 Nine-piece counter top appliance includes blender, juice extractor, small and large containers for procesing, stainless steel chopping and whipping blades, storage lid and shaker top. Powerful 260 watt motor. Cups, lids and blades are dishwasher safe. With your help we can reach more people and let them know about Power Chopper whether this product works or not. I use this appliance daily - it's left on the counter and used for practically everything...EXCEPT FOR chopping vegetables or anything you may want chunky--it pulverizes everything. I have to use my mini chopper for salsa or denver style omelets. I love this thing. Unfortunately it just broke the plastic spindle driver for the blade...dang. I'm going to miss it terribly until fixed or replaced.